The 5th Sunday of Lent is behind us, and we are now entering a period of increasing activity... and quiet. Below is a summary of events taking place in the days leading up to the Easter Triduum. I hope you will consider each one carefully, especially Penance Monday. We are a Faithful community, called to come together in activity - and in prayerful silence. 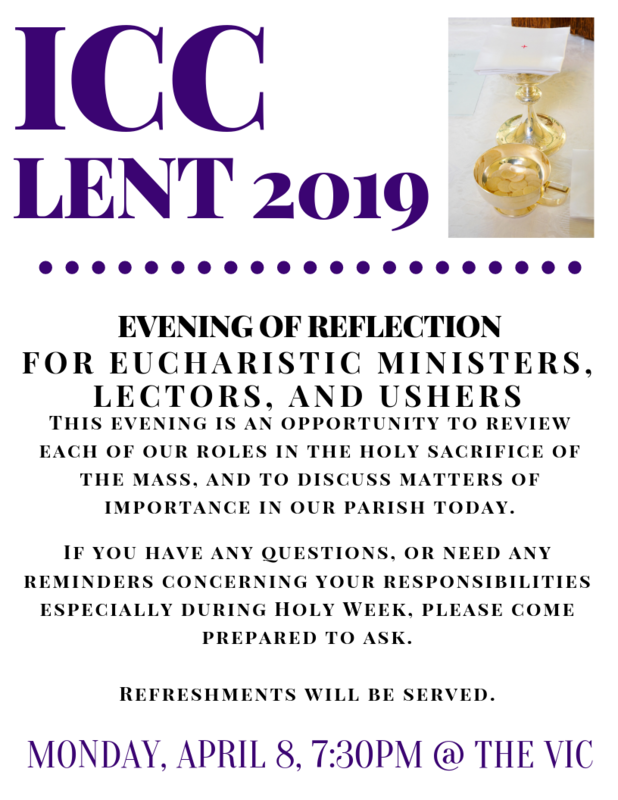 Our Lenten Evening of Reflection, intended for Eucharistic Ministers, Lectors and Ushers, is an opportunity to discuss questions you may have, and matters relevant to us today. Anyone interested in joining one of these ministries is welcome to attend, as well. Refreshments will be served. Kindly RSVP to the Rectory 591-7480 if you have not done so already. This Friday we have an opportunity to gather and share in a meager, meatless supper together. Fr. Roy and I will be present to speak with you about Lent, and answer any questions you might have. Following the supper we will participate in the Stations of the Cross. RSVP below, or click here for our website. 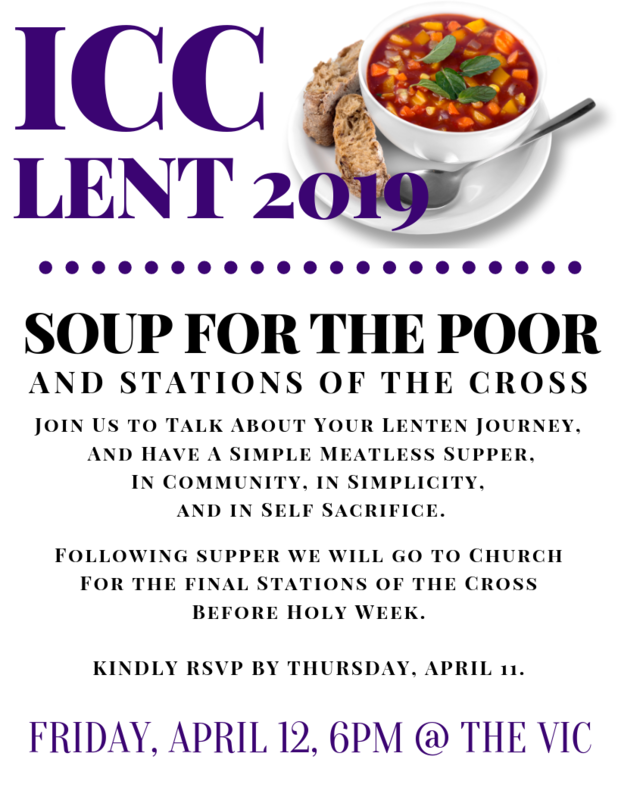 I plan to participate in our Soup For The Poor and Stations of the Cross. The Sacrament of Reconciliation will be available to all of our parishioners on Monday, April 15, throughout the day. Complete Lent, and prepare for Easter, by readying your heart and your soul. Participating in a traditional Passover meal sheds light on the Faith. 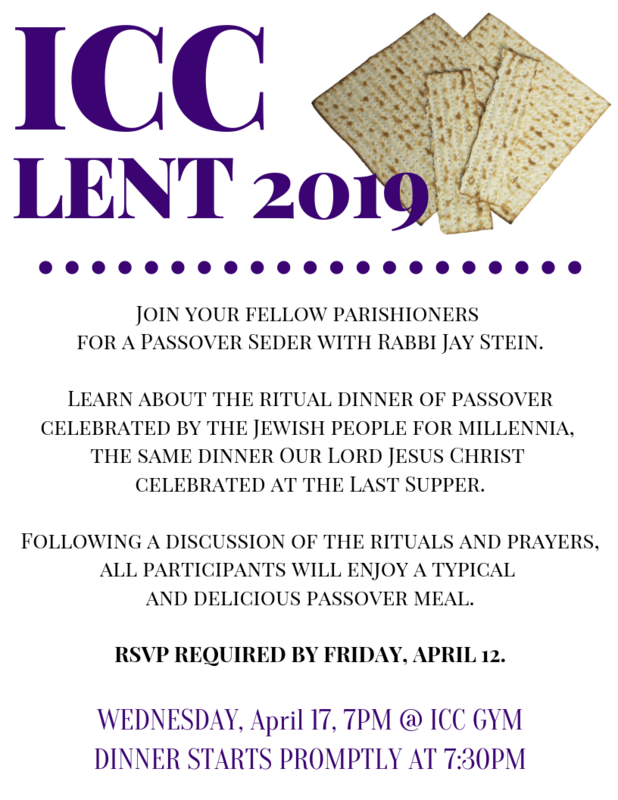 Rabbi Jay Stein will take us on a thoughtful and humorous journey through the rich, rituals of this biblical tradition. RSVPS ARE REQUIRED AS IT CONSISTS OF A SIT DOWN DINNER. RSVP on our website by clicking here, or by responding below. Holy Week is the most important week of the Church's calendar. It leads us to the culmination of our Faith.